Are you on a metered connection or need the bandwidth for something else? You can schedule an upload using the Windows Scheduler and a batch script. Make sure you have activated your Express Send Plus software and have checked the REMEMBER ME box on the login page. "C:\Program Files (x86)\Text Connects\Express Send\expresssend.exe" /scheduled //"GALLERY HERE" "PHOTO" "PHOTO" "PHOTO" "KEEP GOING IF YOU NEED"
"C:\Program Files\Text Connects\Express Send\expresssend.exe" /scheduled //"GALLERY HERE" "PHOTO" "PHOTO" "PHOTO" "KEEP GOING IF YOU NEED"
Let's break this down, the first line is needed for Windows logic. The Next Part is the location of your Express Send install- I have included the default location on Windows 8 and 7, you may need to look thru your computer to find this folder. //"GALLERY HERE" - This is a little complex, you need to first have the two //, then in quotes, you need to write the studio name \ gallery name. 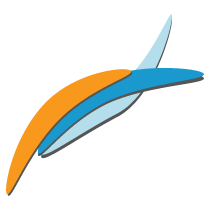 The easiest way to figure this out is to upload one image to Zenfolio using Express Send. When you see the gallery selections, your studio name is the top most text. Then every time you have a subsection insert a .
Referencing the image above (if you don't see it, I attached it to this email as well). 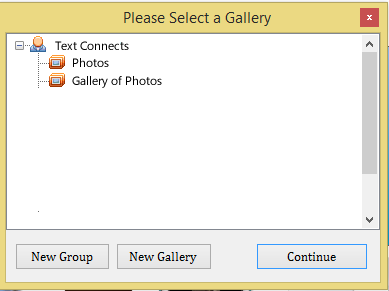 The first folder would be setup like this: //"Text Connects\Photos"
The second gallery would be setup like this: //"Text Connects\Gallery of Photos"
(Due to a limitation with Zenfolio, you must use the correct cAsE or it won't work). The last segment is where you put in the location of your photos, you can either list the individual photos or the folder itself. So if you had your photos in a folder located at C:\Photos and you had 3 photos in there named photo1.jpg, photo2.jpg, and photo3.jpg. You could either use "C:\Photos" and that would upload all the photos to Zenfolio. Or you can specify each photo individually, "C:\Photos\photo1.jpg" "C:\Photos\photo2.jpg" "C:\Photos\photo3.jpg"
C:\Program Files (x86)\Text Connects\Express Send\expresssend.exe /scheduled //"Text Connects\Photos" "C:\Photos"
C:\Program Files (x86)\Text Connects\Express Send\expresssend.exe /scheduled //"Text Connects\Photos" "C:\Photos\photo1.jpg" "C:\Photos\photo2.jpg" "C:\Photos\photo3.jpg"
Now save your file somewhere you can find it, maybe right at C:\ and name it upload.bat. Make sure in the SAVE AS TYPE you select ALL FILES. Select the upload.bat file you just created as the program you want to run.